Author/Opus: This is the 183rd puzzle from Thomas Snyder, aka Dr. Sudoku. 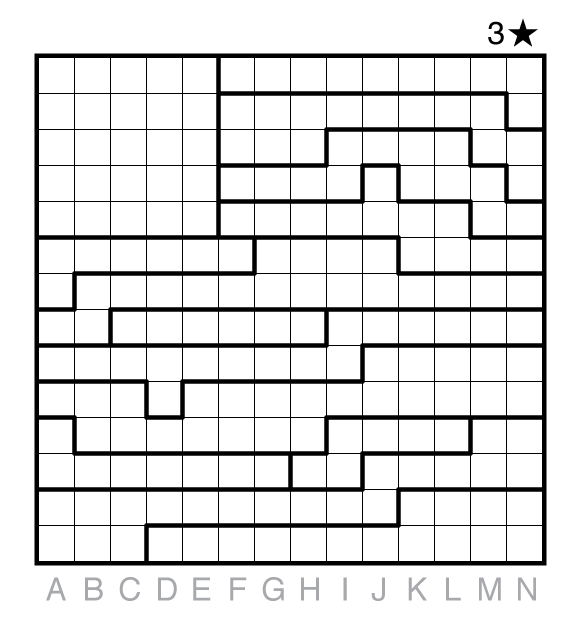 Answer String: Enter the column letter of the MIDDLE STAR in each row, going from top to bottom. Use capital letters only. Hmm, 14 rows, 3 stars per row. That’s 42 stars total. Let’s party like it’s 1889! Surprisingly pretty easy for a 3-star Star Battle. Nice puzzle. Struggled a bit after the first 22 stars, but very nice !